To run a split URL test across your website, use the URL matches pattern option to define the set of URLs you want to include in the campaign. For example, if you are testing different themes, sidebar location, placement of ads, and so on, define the URL pattern for both control and variation, using the wildcard * (an asterisk) to match a part of the URL. For example, if a user lands on http://www.example.com/test/index.html, then Variation URL after redirection would be http://www.example.com/b/test/index.html. ATTENTION Ensure that each control URL has a corresponding variation URL. VWO does not capture the data if there are no corresponding URLs or if the page throws the 404 error. 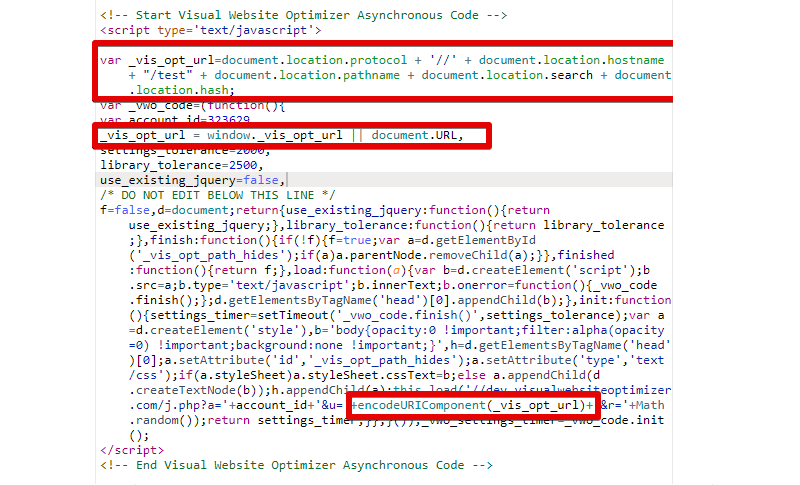 Also, make sure that VWO smart code is added to every page where you want to run the split URL test. The negative regex will make sure that the test will run only on the specified pages. Custom URLs are used to run VWO tests on multiple pages of a website when it does not have a consistent pattern in the URLs. For example, consider an ecommerce website that has several independent URLs for category or product pages without any defined pattern, like http://example.com/adidas/, http://example.com/reebok/, http://example.com/microsoft/, http://example.com/adobe/, and you want to run the test on only on shoes pages (the first two URLs). You can use the Custom URL option to define an imaginary custom URL as an identifier for the pages you want to test, even if the URL may not exist. In case of a split URL, a custom URL campaign needs to be set up, per the requirement and URL structure of the test website. Therefore, feel free to reach out to support@vwo.com if you need any help in building a custom URL for your requirement. Note that this value will change according to your use case. var _vis_opt_url = typeof(_vis_opt_url) == "undefined" ? document.URL : _vis_opt_url;….